Hand-Held Refractometer | ATAGO CO.,LTD. How to choose suitabe model? MASTER-53α are capable of measuring not only various kinds of juice, coffee, and other beverages but also processed food such as sauce, ketchup, low calorie jam, etc.These are an Automatic Temperature Compensation (ATC) model with water resistant feature (IP65).The MASTER-53α is made of metal, and the MASTER-53Pα is plastic. The specifications are exactly the same. For salty and acidic samples, choose the plastic body, MASTER-53Pα. MASTER-53T are capable of measuring not only various kinds of juice, coffee, and other beverages but also processed food such as sauce, ketchup, low calorie jam, etc. These are an Automatic Temperature Compensation (ATC) model. The MASTER-T / PT series is a good alternative choice when the water resistant feature is not a priority.The MASTER-53T is made of metal, and the MASTER-53PT is plastic. The specifications are exactly the same. For salty and acidic samples, choose the plastic body, MASTER-53PT. MASTER-53M are a good alternative choice when the water resistant feature is not a priority and the Temperature Compensation will be carried out manually. Not equipped with the Automatic Temperature Compensation feature.The MASTER-53M is made of metal, and the MASTER-53PM is plastic. The specifications are exactly the same. For salty and acidic samples, choose the plastic body, MASTER-53PM. For the model with Automatic Temperature Compensation please choose MASTER-53α. Opaque, inhomogeneous liquids can be difficult to get a clear boundary line with a conventional refractometer. This model is recommended for cream-based sauces, yogurt, mayonnaise, and various emulsions used in industrial processing. 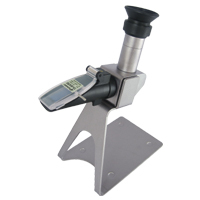 MASTER-53Pα are capable of measuring various kinds of juice, coffee,sauce, ketchup.These are an Automatic Temperature Compensation (ATC) model with water resistant feature (IP65).The MASTER-53α is made of metal, and the MASTER-53Pα is plastic. The specifications are exactly the same. For salty and acidic samples, choose the plastic body, MASTER-53Pα. MASTER-53PT are capable of measuring various kinds of juice, coffee,processed food such as sauce, ketchup etc. This has an Automatic Temperature Compensation (ATC) function and is a good alternative choice when the water resistant feature is not a priority.The MASTER-53T is made of metal, and the MASTER-53PT is plastic. The specifications are exactly the same. For salty and acidic samples, choose the plastic body, MASTER-53PT. MASTER-53PM is a good alternative choice when the water resistant feature is not a priority and the Temperature Compensation will be carried out manually. Not equipped with the Automatic Temperature Compensation feature.The MASTER-53M is made of metal, and the MASTER-53PM is plastic. The specifications are exactly the same. For salty and acidic samples, choose the plastic body, MASTER-53PM.For the model with Automatic Temperature Compensation please choose MASTER-53Pα. MASTER-20α are low concentration model (measurement range Brix 0.0 to 20.0%) of the MASTER-α / MASTER-Pα. Good for measurements of low concentration fruit juices, cutting oil, etc. It is Automatic Temperature Compensation (ATC) model with water resistant feature (IP65).The MASTER-20α is made of metal, and the MASTER-20Pα is plastic. The specifications are exactly the same. For salty and acidic samples, choose the plastic body, MASTER-20Pα. MASTER-20T are low concentration model up to Brix 20.0% suitable for juices, cutting oil etc. This is a good alternative choice when the water resistant feature is not a priority.The MASTER-20T is made of metal, and the MASTER-20PT is plastic. The specifications are exactly the same. For salty and acidic samples, choose the plastic body, MASTER-20PT. 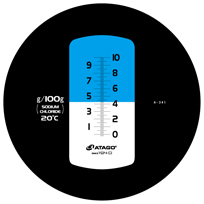 MASTER-20M is for low concentration such as juices and cutting oil etc.and is a good alternative choice when the water resistant feature is not a priority and the Temperature Compensation will be carried out manually. Not equipped with the Automatic Temperature Compensation feature.The MASTER-20M is made of metal, and the MASTER-20PM is plastic. The specifications are exactly the same. For salty and acidic samples, choose the plastic body, MASTER-20PM. For the model with Automatic Temperature Compensation please choose MASTER-20α. 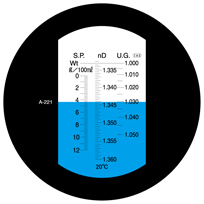 MASTER-20Pα is for low concentration measurements such as juices, cutting oil, etc. It has the automatic Temperature Compensation (ATC) model with water resistant feature (IP65).The MASTER-20α is made of metal, and the MASTER-20Pα is plastic. The specifications are exactly the same. For salty and acidic samples, choose the plastic body, MASTER-20Pα. 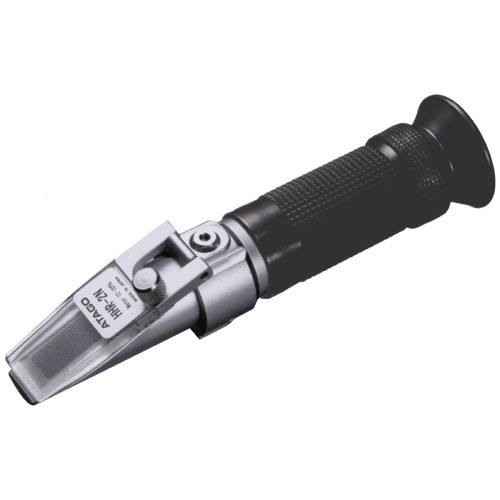 MASTER-20PT is for low concentration measurements such as juices, cutting oil, etc. This is a good alternative choice when the water resistant feature is not a priority. 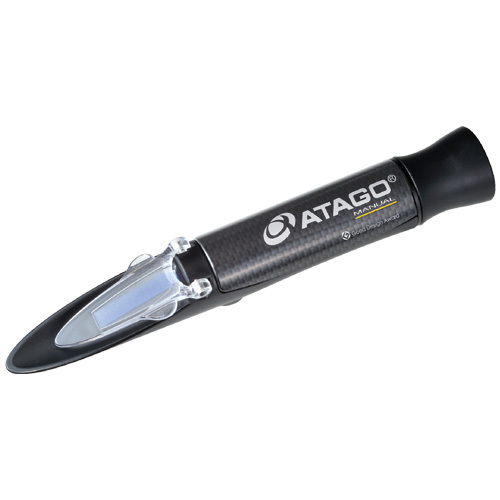 The MASTER-20T is made of metal, and the MASTER-20PT is plastic. The specifications are exactly the same. For salty and acidic samples, choose the plastic body, MASTER-20PT. 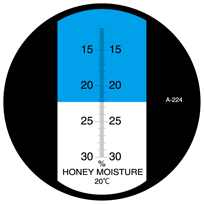 MASTER-20PM is for low concentration measurements such as juices, cutting oil, etc. The MASTER-M / PM series is a good alternative choice when the water resistant feature is not a priority and the Temperature Compensation will be carried out manually. Not equipped with the Automatic Temperature Compensation feature. The MASTER-20M is made of metal, and the MASTER-20PM is plastic. The specifications are exactly the same. For salty and acidic samples, choose the plastic body, MASTER-20PM.For the model with Automatic Temperature Compensation please choose MASTER-20Pα. 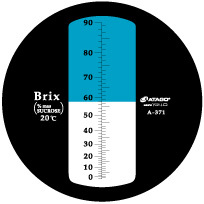 MASTER-500 is 0-90% wide brix model of the MASTER-Series with heat resistant and Water resistant. The MASTER-50H is developed for measuring high-temperature samples up to Brix 50%.It has an automatic temperature compensation and a water resistant function. The MASTER-80H is developed for measuring high-temperature samples such as jam, marmalade and candies.It has an automatic temperature compensation and a water resistant function. The MASTER-93H is developed for measuring high-temperature samples such as jam, marmalade and candies.It has an automatic temperature compensation and a water resistant function. The MASTER-100H is developed for measuring high-temperature samples such as jam, marmalade and candies.It has an automatic temperature compensation and a water resistant function. 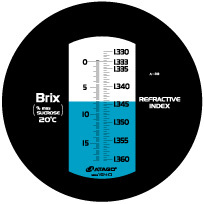 MASTER-RI is refractive-index model.It can be used for measuring the refractive index of vegetable oil, petroleum, oil slicks, etc. Optimized for measuring Brix concentration of plant juices from leaves,stems and roots with an only a small amount of liquid. This instrument measures the salinity and specific gravity of seawater, and utilizes a new material that is durable against salty samples, The salinity of seawater is displayed in parts per mill (‰). The MASTER-S/MillM is a good alternative choice when the water resistant feature is not a priority and the Temperature Compensation will be carried out manually.For the model with Automatic Temperature Compensation please choose MASTER-S/Millα. It has dual scales of Brix and Salinity, all-in-one unit for measuring concentrations of beverages, fruit juices, and soups as well as salt in water. This instrument is designed to meaure salt water concentration such as in cooking or rinsing seafood It utilizes a new material that is durable against salty and acidic samples. 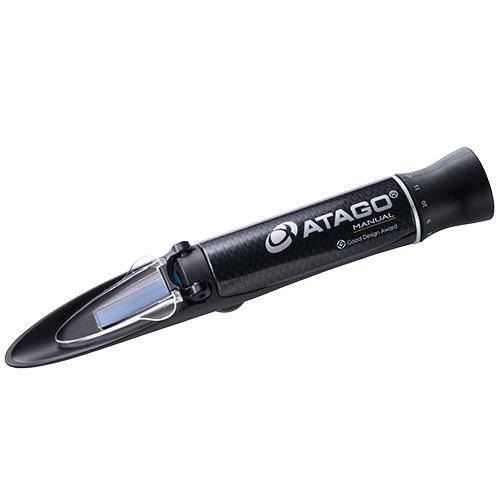 It has an Automatic Temperature Compensation (ATC) model with water resistant properties (IP65). 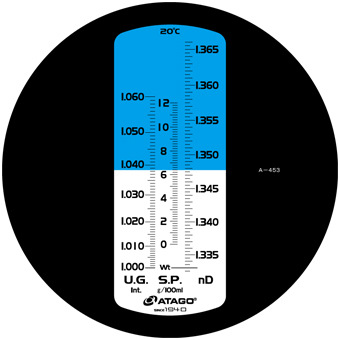 The units can be used for controlling the concentration of saltwater used in rinsing seafood or salinity in cooking. NEW material which is durable for salty and acid sample is adopted. It has an Automatic Temperature Compensation (ATC) model with water resistant properties (IP65). 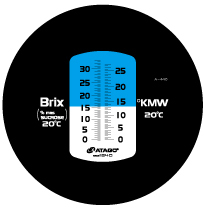 The units can be used for controlling the concentration of saltwater used in rinsing seafood or salinity in cooking. NEW material durable for salty and acid sample is adopted. The Master-S28M is a good alternative choice when the water resistant feature is not a priority and the Temperature Compensation will be carried out manually.For the model with Automatic Temperature Compensation please choose MASTER-S28α. This dual-scale hand-held refractometer measures both the water content and Brix of honey. 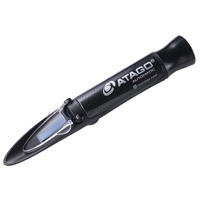 This model has an automatic temperature compensation and water resistant function. This is the essential item in creasing your Ramen.This model can measure not noly the concentration of Soup and Tare but also baume of kansui used during making the noodle.It has the function of Automatic temperature compensation. You do not need to care about the temperature even for measuring the high temperature soup. 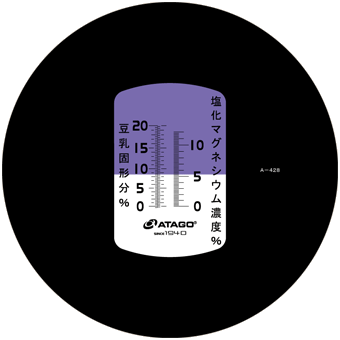 This is the essential item in creasing your Ramen.This model can measure not noly the concentration of Soup and Tare but also baume of kansui used during making the noodle.This model does not have the function of Automatic temperature compensation and water resistant.For these functions, please choose MASTER-Ramen α. The MASTER-SoyMilk series has become an essential tool for soy food products manufacturers. This dual-scale unit can measure the concentrations of soybean solids as well as of “nigari” (magnesium chloride) used in tofu production. The soybean solid concentration scale complies with measurements by infrared moisture meters. The MASTER-SoyMilk series has become an tessential tool for soy food products manufacturers. This dual-scale unit can measure the concentrations of soybean solids as well as of “nigari” (magnesium chloride) used in tofu production. The soybean solid concentration scale complies with measurements by infrared moisture meters. Easily check the moisture of cooked rice! You can easily check the moisture of rice with just a couple of cooked rice. 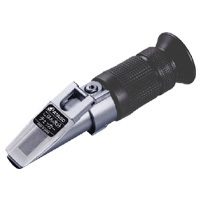 It can measure quickly compared with the moisture analyzer of the heat drying type. You can also diagnose gelatinized state of cooked rice depending on whether the boundary line is clear. This model is wine refractometer which has the scale of TA, used for measuring grape must concentrations. It comes with Automatic Temperature Compensation function (ATC) and Water Resistant feature (IP65). This model is wine refractometer which has the scale of OE, used for measuring grape must concentrations. It comes with Automatic Temperature Compensation function (ATC) and Water Resistant feature (IP65). This model is wine refractometer which has the scale of GOE, used for measuring grape must concentrations. It comes with Automatic Temperature Compensation function (ATC) and Water Resistant feature (IP65). This model is wine refractometer which has the scale of KMW, used for measuring grape must concentrations. It comes with Automatic Temperature Compensation function (ATC) and Water Resistant feature (IP65). This model is wine refractometer which has the scale of BAUME, used for measuring grape must concentrations. It comes with Automatic Temperature Compensation function (ATC) and Water Resistant feature (IP65). This can be used for measuring the concentration and freezing temperature of ethylene glycol and propylene glycol. This refractometer has an exclusive scale for measuring specific gravity of battery fluid and forchecking the freezing temperature of ethylene glycol and propylene glycol which are used as antifreeze mixture in automobiles, thermal catalyst for solar power systems and other industrial applications. The MASTER-URC/Nα is designed to quickly and easily measure Urine Specific Gravity with just a single drop of sample. The new plastic body design is resistant against corrosion from salty and acidic samples, and incorporates an improved optics system for higher contrast and better clarity. Simple to use, lightweight, and portable! 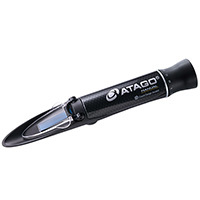 It is featuring a water resistant design and Automatic Temperature Compensation. 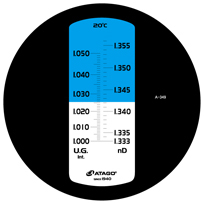 The MASTER-URC/NM is designed to quickly and easily measure Urine Specific Gravity with just a single drop of sample. The new plastic body design is resistant against corrosion from salty and acidic samples, and incorporates an improved optics system for higher contrast and better clarity. Simple to use, lightweight, and portable! The MASTER-URC/NM is a good alternative choice when the water resistant feature is not a priority and the Temperature Compensation will be carried out manually. 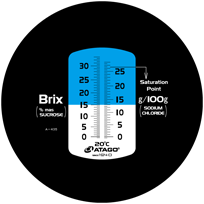 The MASTER-SUR/Nα is designed for clinical purposes: "Serum Protein", "Specific Gravity of Urine" and "Refractive Index". The plastic body model is designed to be resistant salty and acidic samples. It is an Automatic Temperature Compensation (ATC) model with water resistant properties (IP65). The MASTER-SUR/NM is designed for clinical purposes: "Serum Protein", "Specific Gravity of Urine" and "Refractive Index". The plastic body model is designed to be resistant salty and acidic samples. The MASTER-SUR/NM is a good alternative choice when the water resistant feature is not a priority and the Temperature Compensation will be carried out manually. Not equipped with the Automatic Temperature Compensation feature. Urine specific gravity and blood serum protein of dogs and cats can be quickly measured with a single drop of sample.Equipped with automatic temperature compensation (ATC) feature, and water resistance (IP65) feature that allows for the unit to be rinsed under running water for easy clean-up after measurement. 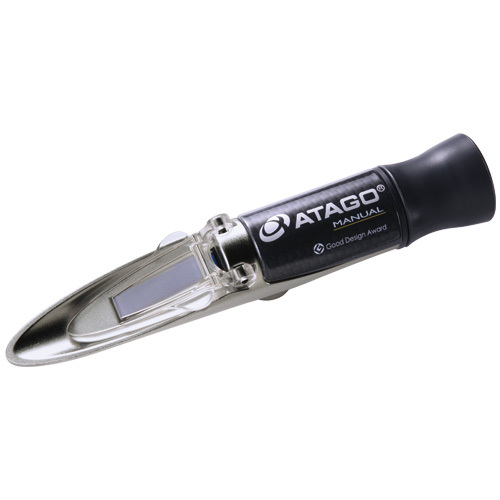 The honey refractometer is specially designed to determine the percentage of water contained in honey by means of the refractive index. 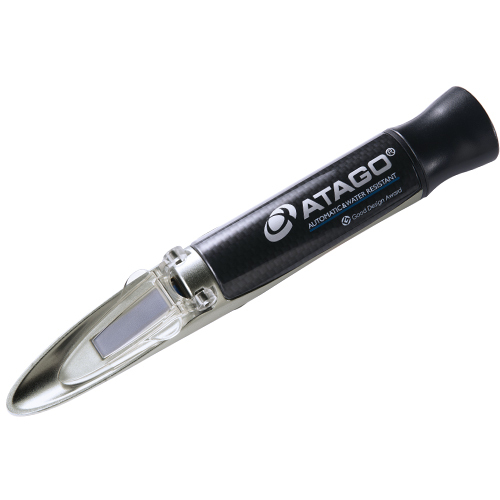 This is a desktop clinical refractometer that allows for hands-free operations.It has 3 scales – serum protein, urine specific gravity, and refractive index.Designed for ease of use and simplicity, the stand has a space for a receptacle, and the daylight plate has a handle for opening/closing. This is a desktop refractometer that allows for hands-free operations. Designed for ease of use and simplicity, the stand has a space for a receptacle, and the daylight plate has a handle for opening/closing.